The Auburn Insurance Center was started from scratch by Stan and Carol Washler in 2001. 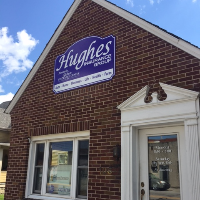 In June of 2014, the agency was acquired by Benjamin Schoettmer and David Callahan of Hughes Insurance Group, and continued operating under the name Auburn Insurance Center until August of 2017 when the name was changed to Hughes Insurance Group. Stan remains an active part of the agency.